Oops, that pollution actually is kinda pretty. Photo by Mike King. A new campaign in the center of Michigan is looking to raise awareness for contaminated watersheds. The project, Pollution Isn’t Pretty, has the support of several local eco-protection groups, such as Eaton Conservation District. The main source of drinking water in this greater Lansing area comes from groundwater, and the condition of that groundwater has been kept clean and safe through the effort of groups like Eaton Conservation District and friends. However, the surface water’s quality in the area is the concern and focus of the new campaign. As an area grows more densely occupied and developed, pollution increases. Impervious surfaces gather impurities that run into streams or rivers. Simple fixes like green roofs, tree planting, and rain gardens are ways that homeowners can create long-run eco-friendly impacts on their watersheds. 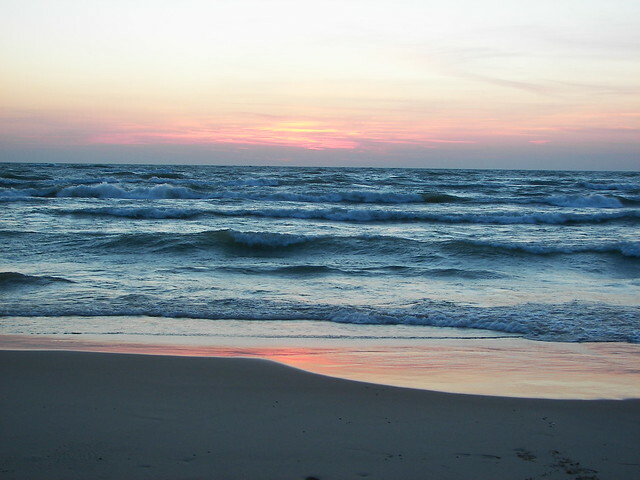 Lake Michigan sunset by Roger Johnson. Pollution Isn’t Pretty emphasizes that pollution comes in various forms, and that we as individuals have a significant impact on our water sources. The campaign promotes facts about water pollution, such as this one: “The Great Lakes contain nearly 20 percent of the world’s and 90 percent of the United State’s fresh surface water supply. Reducing pollutants in your backyard can help keep the Great Lakes clean.” Along with raising awareness, the campaign wants to help people make better choices. Suggestions include planting native plants, picking up pet waste, and washing cars on lawns versus driveways. The campaign will soon be using public announcements on billboards and radio shows to identify actions that pollute the watershed. The tips provided by the Pollution Isn’t Pretty campaign can be applied to caring for any watershed in the United States, as well as worldwide. Many are taking further action through Creeklife to clean up their community rivers and streams, like the Potomac River Watershed Cleanup. Browse the website to learn more about protecting your local watershed and nurturing water resources across the United States.